In this day and age, being able to take a good picture for social media seems to be a skill that we’re all trying to master. Whether it’s taking fifty versions of the same selfie to try and get that perfect angle, making sure to grab a snap before you tuck into your food or just wanting to share a part of your life in the best light possible, sharing pictures to social has become somewhat of an art. It’s the same with your home. Platforms like Instagram and Pinterest have become the go-to websites for many people when looking for décor inspiration, yet trying to capture your own kitchen design in the best way can sometimes prove a tricky task. There is a tonne of simple things you can do so you can take your kitchen photos to the next level and make them look as good as your favourite interior designers/bloggers. There’s a reason, your kitchen photos don’t usually look like they’re straight out of an interior designer’s website, you haven’t had the time to prepare yet. You can have the cleanest, most well-designed kitchen in the country, but if no one can see it properly then no one is going to care. This is why finding the right lighting is crucial for taking good pictures. While plenty of us can’t afford fancy camera equipment or proper lighting set up, there’s still a lot you can do to get a well-lit shot. If you’ve ever heard of the ‘magic hour’ then you’ll know that light is generally softest early in the morning or just after the sun has set. When this lighting illuminates your space is entirely dependent on which way your windows face, so make sure to do a few test shots at various times of the day to see when it looks best. Also, always make sure not to take a picture looking directly at a window as this may cause the rest of the kitchen to look dark. Odds are you don’t own any professional-grade lighting boxes, but you can still take advantage of your kitchen’s own fixtures to take better pictures. Strategic lighting is great for spotlighting certain areas e.g overhead lighting above kitchen islands or under-cabinet L.E.Ds to highlight other areas. One thing you don’t want to do when taking kitchen photos is to catch any unwanted reflections. Kitchens have plenty of reflective surfaces to be wary of, from metallic kettles and toasters to glossy cabinets. To avoid annoying starbursts, remove any shiny objects that you can and also make sure to take your picture from a higher angle. That will help to minimise the risk of unwanted flashes. Using the flash on your camera will also always result in a bright spot in the middle of your room. As long as you have ample lighting on your space, an extra flash shouldn’t be necessary, especially if you’re trying to avoid creating more distracting lights in your kitchen photos. If you’re trying to take a picture of something glassy, surrounding it with darker objects or shade will help stop reflections as well as define the edges more. Like with most things, it’s trial and error, so if you find you’re getting annoying reflections, try adjusting different aspects of your space or angle until you get the desired effect. Once you’ve perfected your lighting and have made sure there aren’t any pesky reflections, the next step is making sure that you’re choosing the right angle to shoot from. While it might not seem like that big a deal, the right angle is crucial for not only setting the right mood but making your space look the best that it can. If you’re working with a smaller room, clever angels can open up your space as well as adding more depth. For example, taking a shot from above can make the picture look flat whereas taking it from a more diagonal angle makes a much more interesting picture, adding much more depth. If you’ve never experimented with different angles before, try one of the simplest techniques to widen your shot. Place a chair in the corner of your kitchen and take the picture from an elevated angle. This should bring a whole new dimension to your picture and change it up from a standard shot taken at standing height. Finally, nothing makes a picture more your own than adding your own personal touch. The kitchen is the heart of the home so it’s the perfect place to express your own sense of style. Whether it’s adding a flower arrangement or a clear vase of lemons to give the room a pop of colour, leaving an open book on the side or prominently featuring your favourite recipes or prints, there’s an endless list of ways to really make those kitchen photos your own. We’ve got a whole other blog covering more ideas that you can check out HERE. 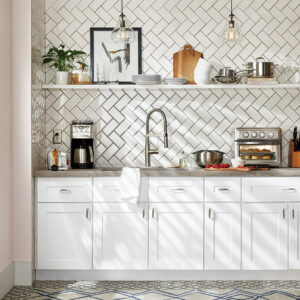 Got some kitchen design ideas or just looking for a redesign in general? Whatever kind of style you’re interested in, we can help you find everything you’re looking for, from the walls to the table and chairs, to the tiles. 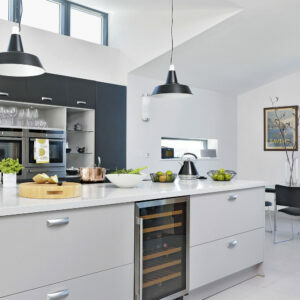 Have a look at our designs page if you need inspiration or have a read through the rest of our blog for more helpful insights on style, colour and useful tricks to make your kitchen the most dazzling room in your home.